The GoPro Hero5 Black action camera has a big reputation to maintain. Stop anyone in the street, ask them to name an action cam and it's highly likely they will blurt out 'GoPro'. It's a name that has become synonymous with folk who like to throw themselves off mountains at the weekend and is often regarded as one of the sturdiest, most robust and high-performing video cameras out there. However, a whole host of rivals have been attempting to muscle in on the extreme sports documenting patch of late. Be it TomTom's Bandit, Veho's range of Muvi cams or Garmin's impressively high-tech Virb Ultra and XE. It boasts a shedload of cool new features, an overhauled range of accessories and the introduction of the Karma drone, which GoPro claims to be one of the easiest to operate and most portable quad-copters in the world. It's an impressive arsenal of filming gear, which has the potential to lend the air of a big budget Hollywood production to even the most mundane subjects. I dusted off my skate shoes, practiced using the word 'sick' as an adjective to describe something impressive, and joined a bunch of GoPro athletes in Mallorca to test out the latest camera. We also got an exclusive look at the Karma drone. You can read my thoughts on that at the end of the main review. The entire GoPro line-up has been refreshed so it now starts with the Hero Session, moves up to the Hero5 Session and tops out at the top-spec Hero5 Black, which is what we're concerned with here. GoPro describes the range as "good, better, best" but we're focussing on the Black Edition purely because it's the most capable camera on offer, and what's the point of accepting anything less? There are plenty of new features for 'gnarly' types to sink their teeth into, including a rear touchscreen, voice activation and super-easy one-button control. The overall user experience has been revamped to make capturing the action as painless as possible. That doesn't mean the new Hero5 Black has dumbed down. It still shoots 4K video at 30fps, snaps 12-meg images and offers ultra-smooth super slow-mo opportunities with 1080p video at 120fps. The basic spec isn't much different to most recent smartphones but the quality is a cut above, thanks to the excellent lens and image processing employed. We're talking broadcast quality footage and really strong stills, from a very compact, robust package. Stills can be taken in single, burst and time-lapse mode, as well as saved as RAW files for professional postproduction tinkering. Plus, a new WDR (Wide Dynamic Range) mode, which is GoPro's version of High Dynamic Range, makes shooting perfectly exposed still images much easier. For the first time, the unit itself is waterproof to 33ft (10m), meaning the bulky plastic housing is only really required if filming in extremely deep, dusty or dirty areas. GoPro's dual microphone set-up also now offers enhanced wind noise reduction. GoPro Hero5 Black Edition: lights, camera, action! I put the GoPro Hero5 Black through its paces in Mallorca, where it was subject to some relatively high-octane Vespa rides around the island, taken on a hike up a mountain, strapped to the new Karma drone (more of that later) and hurled off a boat into the Balearic Sea. Perhaps because it appears a little naked without its protective cladding, the unit itself doesn't feel quite as sturdy as previous offering. However, as a result, it is even lighter and smaller, so easier to carry around and place in tricky shooting locations. It mounts to almost anything using the existing system, so you won't have to go out and buy a load of extra accessories, while controlling the camera is now easier than ever. Settings are accessed via the touchscreen at the rear, or a single press of the shutter button powers the camera and starts recording automatically. Lone users without a camera operator can now also bark commands, such as "GoPro, take a picture" and "GoPro, shoot burst", to get the camera rolling. It's handy, but it's no Amazon Echo. Once the commands have been mastered, voice activation is successful maybe 70 per cent of the time. One place it definitely doesn't work is when you're speeding along the open road. That's why GoPro also offers a wireless Remo controller, which is basically a small shutter button that can be clipped onto a lapel or backpack strap and controls the camera via voice or touch. In most lighting conditions, GoPro footage is sharp, with particularly vibrant colours. Advanced audio processing deftly captures left and right stereo audio channels. The optional SuperView FOV supersizes the frame, which means slap-dash mounting isn't punished with footage full of cropped heads. Those with some semblance of photographic know-how can enter the 'ProTune' settings, but for ham-fisted chumps like me, it's perfectly easy to bag good footage using the preset modes. The addition of video stabilisation is also a big plus, as footage is much smoother than before, with the annoying vibration experienced when the camera was attached to handlebars or mounted to the exterior of a car almost obliterated. The 12-megapixel stills are similarly super-sharp, with a 30fps Burst mode great for capturing nail-biting tricks that require a rapid shutter. There's both a standard time-lapse mode and one specifically for low-light situations, but the WDR setting is one that everyday users will likely enjoy the most. This acts in a similar way to a smartphone's High Dynamic Range (HDR) mode, taking multiple shots at different exposures to nail the perfect image. Of course, stuff tends to be moving in a GoPro shot but images consistently feature stark lighting contrasts. You can also get some interesting results when shooting into direct sunlight. Finally, the ability to shoot in RAW format means picky snappers have greater control over imagery in post-production. The age-old problem with action cameras has always been what to do with the footage and pics. However, GoPro's new batch of apps really make the polishing and sharing process much easier. The Quik app for mobile creates automatic edits from selected footage, complete with a soundtrack, which can be uploaded to various social media accounts, tout de suite. There's also a desktop version. This allows wannabe Spielbergs to get slightly more creative, but it's still extremely user friendly, with handsome looking edits possible in a matter of seconds. It's currently not possible to import video clips from the desktop in this Beta version, so all footage has to come from the camera. We are assured updates will be made in the coming months. The camera isn't without a few minor issues, the first being the rear touch-screen display. This is annoyingly unresponsive with wet or muddy fingers and simply refuses to play ball when it's raining. More worryingly, we found that the lens started to steam up after a spot of boat-leaping. GoPro claims the new cameras are waterproof without a casing, but this made me want to revert to using the old plastic casing for surfing, or anything where water could be forced into the housing at high speed. Finally, while the Bluetooth and Wi-Fi pairing process is now much simpler than before - each camera now sports a Wi-Fi name, thus reducing the amount of steps needed to get footage from the camera to a smartphone - the process still feels a little bit clunky. This could be down to the fact that the new smartphone app, dubbed Capture, is still in a Beta phase. It needs to get better, and it probably will. This is a cracking action cam. The best you can get, in fact. It's a great evolution of the firm's tried-and-tested line, featuring plenty of user-friendly extras that make capturing top quality footage a doddle. 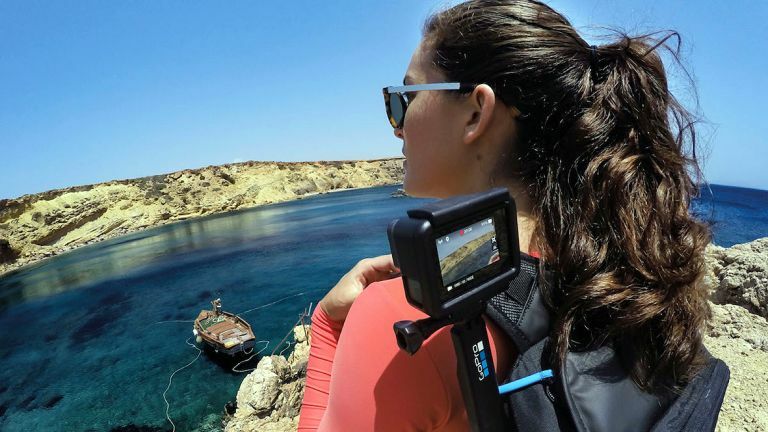 It's powerful enough to offer broadcast quality video, as long as the operator has some expertise, but it's also a brilliant stills and video camera for taking on holiday, tethering to a smartphone and sharing awesome clips and pics with friends and family in an instant. The rear touchscreen won't be for everyone, the voice control is a little sketchy and its waterproofing (without a case) was called into question during our short test. Those quibbles aside, it's an extremely capable camera that also, of course, comes with a wide eco-system of mounts, software and accessories for all occasions. There have been numerous conversations surrounding the safety of drone usage in this country but hasn't stopped GoPro from unleashing one of the easiest quad-copters to set-up, operate and transport in the world. It's called Karma, an idiot could fly it - I certainly could - and it also neatly folds down into this small backpack. Pilots operate the machine with a game-style control pad that also features a high-quality touch-screen display. Simply fold out the four legs, power up the machine and hit the auto take-off and landing function on the screen. Hey presto, Karma buzzes into life and neatly hovers around 4ft off the ground, ready for action. Two thumb sticks take care of the whole flying business and GoPro's own Karma Grip electronic gimbal houses a Hero5 Black or Hero5 Session, while older cameras will require an adaptor. Impressively, the Karma Grip is actually detachable when not in flight and acts as a brilliant hand-held steady-cam for capturing silky smooth images on the ground. It also doubles-up as an external battery pack to power the GoPro cameras, should you run out of juice mid-recording session. The controller features a number of built-in auto flight paths, such as a Cable Cam, which runs alongside a subject between two set points. Orbit, for circling a subject, and Dronie. Yup, you guessed it - Dronie is a selfie, but one where the drone dramatically pulls back to reveal the subject and the surroundings. Flying the thing is beyond simple and the controls can be set up with reduced sensitivity to help build confidence in new pilots. There's even a digital training simulator accessible from the control screen. Plus, the on-board software has built-in No Fly Zones and an auto-return function should you run into trouble. Better still, GoPro also offers a Passenger App, which allows smartphone owners to link to the Karma Drone controller to take control of the GoPro rig. The pilot still has control over the drone's whereabouts, but it means friends, family and more skilled camera operators can decide what footage is captured.